The cheapest, most convenient way to access your textbook. A full colour printed textbook with an interactive eBook code included. The interactive eBook code is printed on the inside of your book, so you will receive both when your parcel arrives in the post. This code will not be emailed to you. 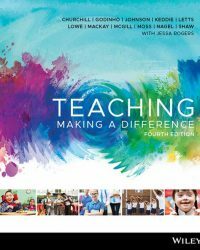 The fourth edition of Teaching: Making a Difference, 4th Edition (Churchill et al.) draws together the voices and contemporary research of Australia’s pre-eminent education academics. The combination of their knowledge, hands-on experience and insight will help you develop your craft and technique, and provide a framework to enable you to excel as a future educator. This market-leading text is accessible for all students and designed to engage and inspire, while staying realistic, practical and jargon-free. Available as a full-colour printed textbook with an interactive eBook code, this title enables every student to master concepts and succeed in assessment, by taking the roadblocks out of self-study, with features that are designed to help you get the most out of the content. You can expect components like videos from teachers that help you connect the theoretical with real world examples, animations and interactivities that are embedded at the point of learning to bring course concepts to life, Concept Check questions that are embedded throughout the text that provide instant feedback and provide guidance for further study, and ensuring students get to have the best of both worlds, with the ability to switch between reading something tangible and studying with online (or offline!) learning resources, through the ability to search, highlight and take notes within the text. Videos from experienced teachers like Dr. Michael Nagel give you valuable ‘tales from the front’ to help take what you’re learning from the theoretical to the practical. Enhanced content for pre-service teachers that provide Aboriginal perspectives and examples of the types of activities that can be done in class to help better educate students on Indigenous culture. Available as a print and interactive eBook, the features are designed to make study easy by removing the roadblocks you often face when using a print text. As part of Wiley’s ongoing commitment to higher education, the Wiley Affordability Program is dedicated to providing you with premium Wiley learning resources at an affordable price. We believe that every student has a right to access quality resources, no matter what your budget. Now, we are even better equipped than before to do what we do best; help teachers teach and students learn. "Purchasing textbooks couldn't have been simpler! Thanks!" 'audio' / 'read' option was incredible"
damaged or have someone else's notes in it…"